Innovative farmers prove the U.S. average corn yield of 170 bushels per acre is just a stop on the way to more food, feed, fuel and fiber. Imagine 500 bushel plus corn yields. David Hula, a corn grower from Charles City, Virginia, doesn’t have to imagine. 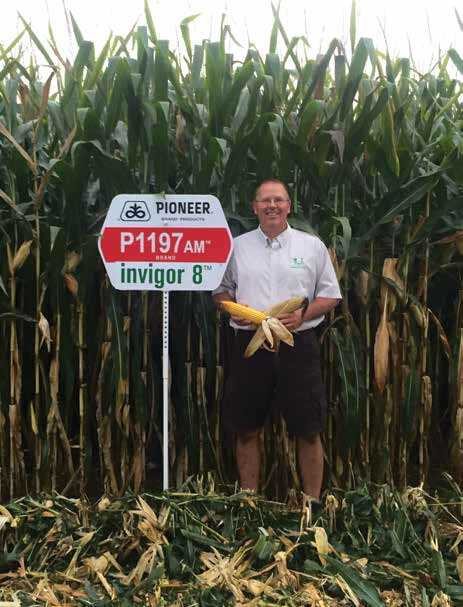 He set the new corn yield record as one of 18 2015 National Corn Growers Association (NCGA) National Corn Yield Contest winners, with 532.02 bushels per acre grown on no-till or strip-till irrigated land. Valdosta, Georgia, farmer Randy Dowdy had the next highest yield, 486.15 bushels per acre, on irrigated land. The Hula family has a long tradition of entering NCGA corn yield contests, David Hula says. His grandfather was one of the first to break the 100 bushel barrier and his father was one of the early ones to go above 200 bushels. In his years of farming, the Hula family has broken the 300, 400 and 500 yield barriers. In fact, David Hula’s son, Craig, is on the list of winners with a yield of 485.36, just behind Dowdy. Dowdy, on the other hand, is a first generation farmer who first entered the contests due to a competitive spirit. Like David Hula, Dowdy says entering NCGA yield contests has meant both making mistakes and learning new things to apply to increase yields across the farm as a whole. For Hula, winning a NCGA yield contest means managing the crop intensively, starting before it’s even planted. He starts out with good corn genetics and pays special attention to things like seed placement and minimizing soil compaction. Another important step is monitoring carefully for when the plants start to emerge, watching in particular for areas where all the plants come up within a four hour time frame. Controlling pests and disease as well as an intensive fertilization program are also key, Hula says. Dowdy, who broke the corn yield world record in 2014, with 503.71 bushels per acre on irrigated land, says he learned about additional seed treatments by talking to Hula. In fact, learning more about how to increase corn yields from others is one of the reasons he entered the NCGA contests. Tissue tests, soil tests and spending a lot of time in the field, while corn is growing, are some of the other strategies he uses. “The best thing a farmer can see in his or her field is their shadow,” he says. Unlike contest winners, the average farmer is cautious and sticks to what he or she knows works, says Dr. Fred Below from the University of Illinois at Urbana-Champaign. The Professor of Crop Physiology at the university’s Department of Crop Sciences says while growers are well aware of the yields achieved by NCGA contest winners, most dismiss it as something they can’t do. But Below has the research that proves yields can be increased, without going to the extremes that corn contest winners do. If the idea of someday doubling current corn yields still seems out of the realm of possibility, Stine says, looking back to the decade of the 1930s puts it into perspective. During that 10-year period, average U.S. corn yield was about 24 bushels per acre. “Today, we are getting seven times that much,” he says, adding that his father, who started farming in the 1930s, would never had believed today’s yields, partially because he couldn’t have guessed that new corn markets, such as ethanol, would develop. “He’d have said, ‘Well, gosh, there’s no way we can use that much corn,’” Stine says. Below considers increasing corn plant density one of the most important factors in raising corn yields. While most farmers today plant corn in 30 inch rows, with 4.6 inch plant-to-plant spacing, research shows corn can be planted in 20 inch rows with 7 inch plant-to-plant spacing. Stine agrees that there’s room for greater plant density. Viewing corn technology advances through the same lens of the 1930s, he says farmers planted about 7,000 corn plants per acre in that decade. Today, farmers plant somewhere in the mid- 30,000 to 40,000 plants per acre. Stine Seed, on the other hand, has corn genetics on the market today that can go even higher, with plant densities up to 45,000 to 50,000, with the right spacing, fertility and management practices. In order to increase plant density, Below says farmers will need change fertilization methods, for better plant nutrition. In fact, better fertilization is one of the main strategies of NCGA contest winners. In contrast, the average corn grower has fertilized in the same way for about 30 years. For example, while most farmers broadcast fertilizer across the field, with banded application, fertilizer is applied 4 to 6 inches deep, directly under the crop row. Stine also points to shorter corn as a factor that can help increase corn yields. In the 1930s corn farmers planted corn in clumps, using horses and without herbicides. “For that situation you needed tall corn,” he says. With corn yield increases in the future, where will all that corn end up? Michael Dwyer, Chief Economist for the U.S. Grains Council (USGC), points to the USDA’s recently released Agricultural Projections to 2025, which show moderate growth for corn exports in the next 10 years. Add that together with corn exports in all forms, meaning meat, ethanol and feed products like distillers grains, the NCGA believes the future looks good. “We think the foreign market is where the action is going to be,” he says. Looking at USDA and USGC projections, foreign demand for grains in all forms is expected to add about 33 million metric tons of demand, or a 35 percent increase, he says. That’s 1.2 billion bushels of new foreign demand for U.S. corn, with commodity corn and ethanol each accounting for 43 percent of the increase, while beef, pork and poultry, in corn equity, and distillers grains and corn gluten feed, account for 16 percent and 10 percent, respectively. “Corn producers have cause for more optimism regarding foreign markets than they have for many years,” he says. With increased demand for meat and, therefore corn to feed livestock, the word’s emerging markets will continue to be the best source of export expansion. However, the hottest markets are now shifting from places like China, India, Southeast Asia and Latin America, where growth was in the past 10 years. The USDA estimates that, in the next 10 years, 70 percent of the global import demand for corn will come from the Middle East and Africa, Dwyer says.